Jim Thompson House in Bangkok: Is It Worth Your Time to Visit? Is a visit to the Jim Thompson House in Bangkok worth it? The Jim Thompson House in Bangkok is a top thing to do in the city since it showcases traditional Thai home design and decor. Still, my husband and I were on the fence about going to the Jim Thompson House since we weren’t sure looking at some house was the best use of our last day in Bangkok. Ultimately, the words “beautifully maintained example of traditional Thai architecture“ in our Lonely Planet guidebook – we would be experiencing architectural culture we told ourselves – and the inexpensive entry price (100 Baht when we were there — now it’s 150 Baht, or roughly $5) won out. In this post, I’m sharing our experience touring the Jim Thompson House and if I think it’s worth your time during a trip to Bangkok. Jim Thompson was an American expat and former architect who moved to Thailand and decided to start a textile business once there – the Jim Thompson Thai Silk Company. He was very successful and his goods are still sold around the world today. He was even awarded the Order of the White Elephant, which is an award given to foreigners of Thailand who have provided exceptional service to Thailand. While living in Thailand, he became intrigued by Thai architecture and wanted to build a house that was based on the traditional style of Thai houses. The house that was to become known as the Jim Thompson House became a legend of sorts in Bangkok due to its opulence, attention to traditional detail, art collection, and vast vegetation surrounding the half acre of property in the middle of Bangkok. During a hike in Malaysia in the 1960s he vanished and his body has never been found. His house has been donated to the city of Bangkok and attracts many visitors who want to see the more residential side of Bangkok – including on one hot December day, Tom and me. My visit to the Jim Thompson House didn’t start out on a very good note. We paid for our tour and then we were handed a ticket with what looked like a time on the front: 2:50. “That can’t be right,” I said in confusion as we walked to the tour check in place as instructed. The employee at the check in desk looked at the ticket and told us to come back at 2:50. It was currently 1:45. Wait, we had to wait over an hour for this thing? “So, basically looking at a house is going to take up two hours of our day,” Tom muttered. “They could have told us that before we bought the ticket.” I had been more interested in coming here than him so now he really wasn’t happy. A beer always puts Tom in a better mood so he agreed grudgingly. We got to the bar onsite…and it was closed. The restaurant was open, but there was an hour wait. Not helpful. Visiting the gift shop, a weird movie art exhibit above the gift shop (“If we stay in here, I’m going to fall asleep,” Tom proclaimed in the dark exhibit), and a foray down the mostly residential street the Jim Thompson House is situated at the end of passed about 30 minutes of time. No local bar to be found. We spent the remaining time sitting on one of the waiting benches in the 90 degree heat, growing more annoyed at a tour we hadn’t even taken yet. Finally, it was our turn for the tour. To start, we had to take off our shoes and put them into a locker as Thai custom involves not wearing shoes indoors. Next, we took off into the courtyard with roughly 20 other visitors. We saw an ancient loom, one of the first used for Jim Thompson’s designs. 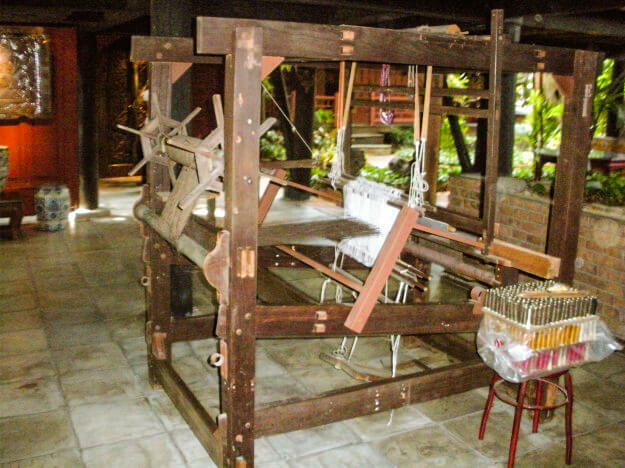 A loom in the Jim Thompson House. We toured the house and learned about the elevated doorways that led to many of the rooms of the house, which involved having to step over the bottom of them to get into each room; they were elevated to keep bad spirits out. The design of the house actually incorporates six traditional Thai houses that were bought and moved to the estate, where they were renovated to fit into the plan’s layout. Therefore, the rooms of the house were separated – it wasn’t a big open floorplan that the modern U.S. architecture is akin to, however the marrying of indoor and outdoor space made the house feel more open than it was. The hallways were outdoors and for the living room led straight into it through massive doors that opened wide. The inside of the living room in the Jim Thompson House taken from outside the entryway doors as visitors are not allowed to take pictures inside the house. My camera was not a fan of this apparently, hence the blurry photo! But it still gives you a glance at the decor you’ll see. Another nice real estate factor for the Jim Thompson house is that it’s situated on one of Bangkok’s klongs (waterways). In fact, back when Jim Thompson was alive, many of his workers lived nearby alongside this river and worked on the fabrics, too, making it easy for him to jump in a boat and monitor work. 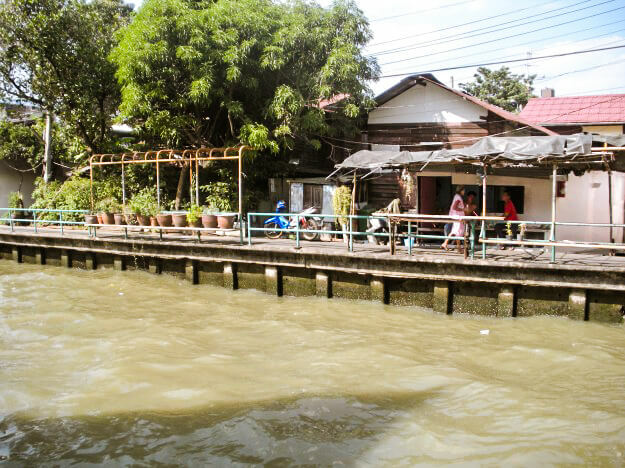 The klong (waterway) that the Jim Thompson house is situated on. My Overall Take on Touring the Jim Thompson House? The house was absolutely lovely and I appreciated the fact that Jim Thompson tried to make the house as reminiscent of the Thai-style as possible, but in the end the fact that it was designed by a millionaire foreigner left it feeling a bit inauthentic and underwhelming. The guide was excellent though in giving a history of Thai architecture in general and I greatly enjoyed hearing about why Thai houses are built the way they are. –> You also might be interested in reading: One Day in Bangkok — a detailed Bangkok itinerary. 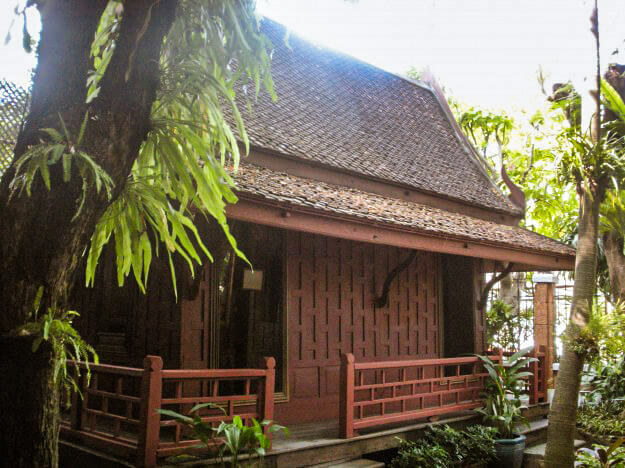 Should YOU Visit the Jim Thompson House During Your Time in Bangkok? The jungle ambiance of the Jim Thompson House. My recommendation for visiting the Jim Thompson House: I’d put it lower on your list of things to see in Bangkok if you’re short on time unless architecture or artwork really interests you. While it was neat to see the layout of a traditional Thai house, it wasn’t as appealing to me as some of Bangkok’s other, more ancient historical sites. Also, if you visit try to swing by in advance to purchase a ticket for later in the day so you don’t have to wait around. Also, if you need a respite from the bustling city life of Bangkok, the soothing, jungle-like setting of the Jim Thompson House will provide the break you need. The Jim Thompson House is open daily from 9 a.m. to 6 p.m. and is located at6 Soi Kasemsan 2, Rama 1 Road in Bangkok, close to the National Stadium. We took a tuk-tuk there. Have you been to the Jim Thompson House? If so, what was your take on it? Note: This post was originally published on September 9, 2012 and updated on January 27, 2018. Bummer that the Anne Frank house was underwhelming. Sometimes it’s so hard to know what’s worth the wait and what’s not! 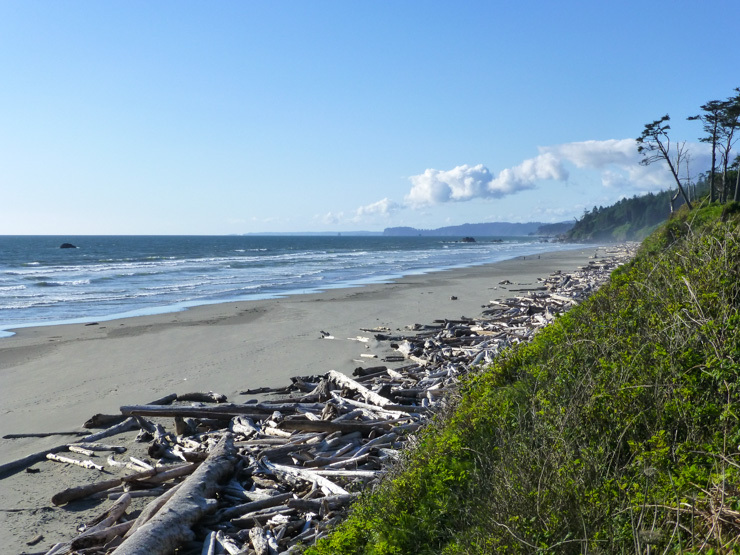 I’ve been there… and it was under exactly the same circumstances as you list – last day, sounded impressive… so I said sure why not. A friend really wanted to go because he wanted to get some silk for his family but like… it was really underwheming. You could find cheaper and nicer silks almost anywhere and the house itself was… well… just as you describe it. Different strokes I guess, but I think it’s more set up for people who either have an interest in the man or… well I’m not sure lol. I have visited Jim Thompson’s house just two weeks ago and as it is a low season currently in Thailand my experience was different – and wonderful. 🙂 We had to wait for our tour also, but just about 20 minutes which was completely ok. Meanwhile I could have checked the fishes in the lakes around the house, take bottle of water from the open bar 🙂 and check the manifestation of the silk production right on the spot. It seems you haven’t seen this one once you were visiting. It was very interesting to see how the little caterpillar eggs are producing the silk threads (or how to call it properly) and how is being processed by a skilled worker. House itself including the art exposed inside is overwhelming and as you mentioned the guide was brilliant. I must say that i have really enjoyed our time there finished by a nice lunch in the restaurant. And one more advise – there is a free little car shuttle running from the main road till the Jim Thompson’s house every 15 min so you can avoid the walk in the painful heat. I definitely thought it was worth a visit. It’s such a nice little green oasis in the middle of Bangkok. You can really step back in time a little when you go through his house and imagine how it looked when he first built it. Glad to hear you enjoyed it, Ryan. That’s a good way to think about the history when touring it.